The only difference from Vivaz is in the addition of QWERTY keypad. 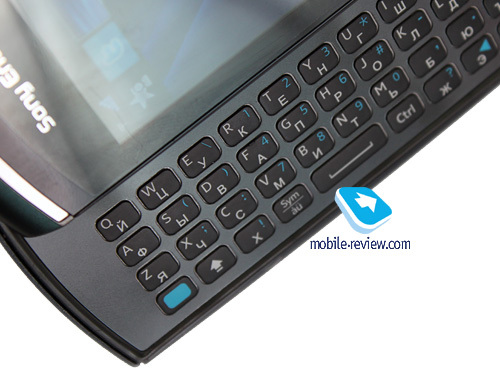 This is a niche model as the number of people who need QWERTY keypad in the side slider below €400 is relatively small. 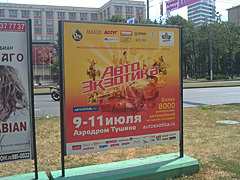 Other solutions, which attract attention, are available as well. 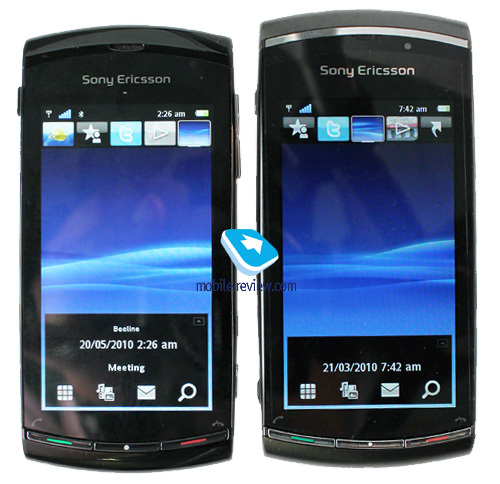 For Sony Ericsson it was a cheap way to come up with one more model without additional R&D expenses. 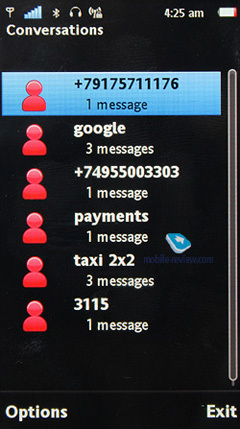 If Vivaz targets young people, here the corporate users are in the center of attention, which is clear from the presence of the keypad. But the shot misses the target as both models have the same audience. 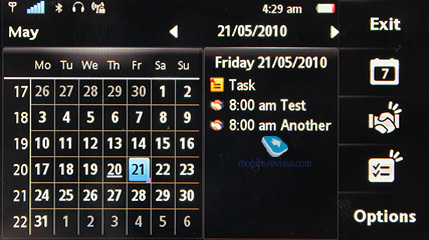 There are no changes here, the phone is chosen predominantly by girls without particular insight into the world of mobile devices, but who need a nice looking solution with the keypad. The first month of sales proves the niche status of the phone. There is some demand for it, but this hero of the shelves will not stay there for long. 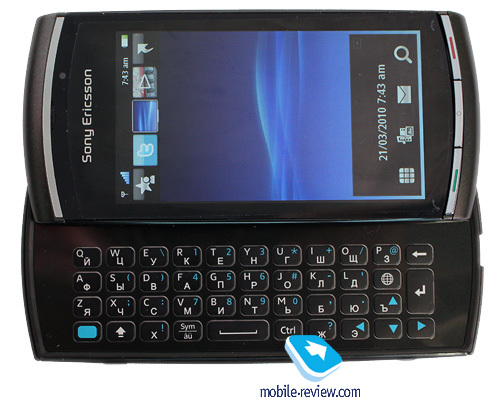 It is not the product Sony Ericsson needs to return to the market. 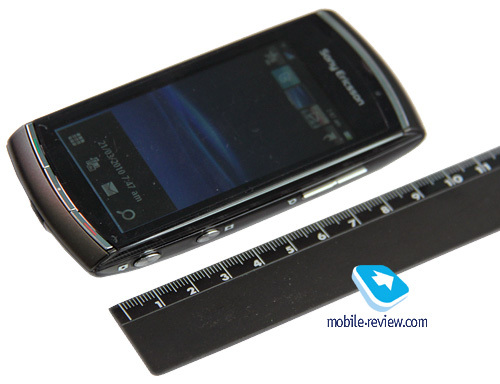 The phone differs from Vivaz in dimensions. 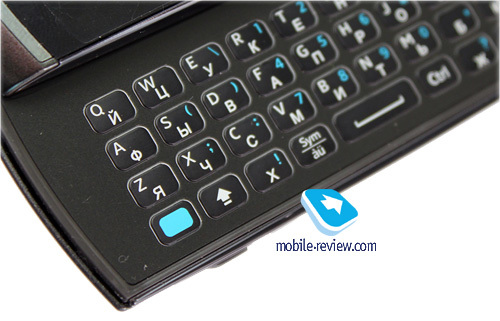 The keypad requires additional space and the model turned out to be bulky, but only in comparison with Vivaz as for modern phones its dimensions are quite modest. The model measures at 109x52x15 mm (4.29"x2.04"x0.59") and weighs at 117 g (4.12 oz) (Vivaz has 107x52x12.5 mm (4.21"x2.04"x0.49") and weighs 97 g (3.42 oz)). The difference is visible if you compare the two models. 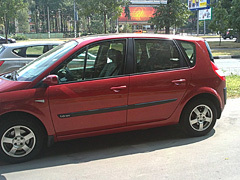 The model is available in two colors – black and light silver. 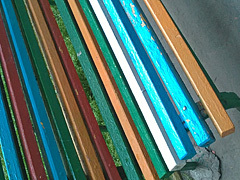 All color solutions are offered in glossy plastic. If you look at it in the light you may notice some shades and the plastic sparkles on edges, which is nice. 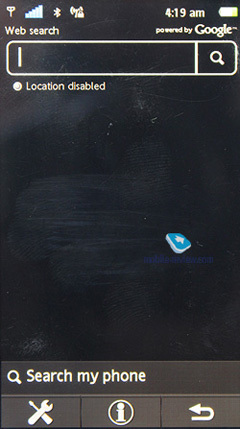 The back cover gets scratched easily and after several minutes of use the fingerprints will be left there as well. 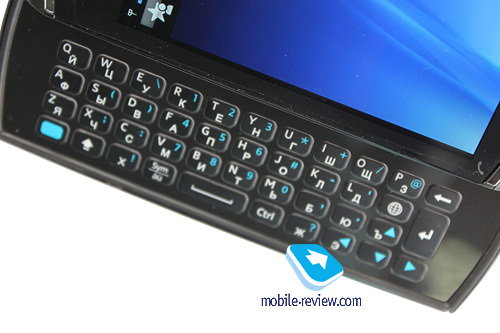 The top features the on/off button, which also locks the keypad (in comparison with Vivaz it is slightly moved to the back panel, which is not very convenient). On the left side we have a 3.5 mm headphones jack followed by a microUSB (synchronization, charger) protected with the rubber cap. On this side you also have a loudspeaker. 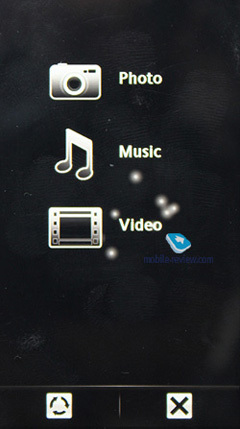 The left side hosts the dual volume control button, video recording and camera buttons, which are separate ones. The bottom has an opening for the hand strap. The microphone is on the left side, which may lead to the inconvenience depending on how you hold the phone in your hands. 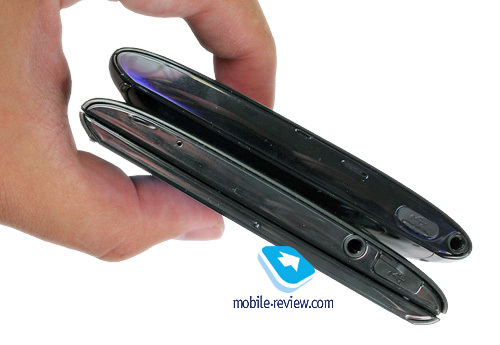 The camera and LED flash are on the back of the handset. 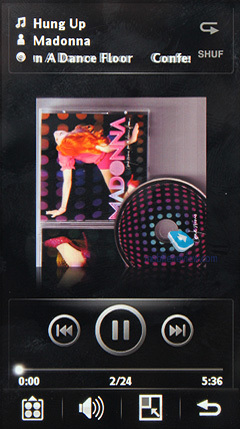 The back cover feels a bit loose, but this feeling does not appear straight away and it usually remains the same afterwards. There is some squeaking when you hold the model in hands, but it is not a big deal. The build is excellent with one small drawback. We have no serious issues here. The side slider has an automatic mechanism, but due to the body size it is hardly felt and you need some efforts to open the slider. 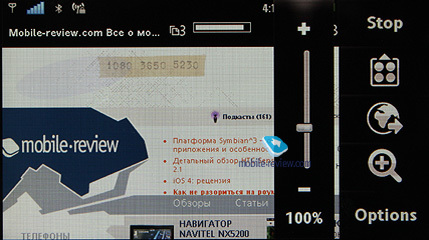 The model is on par with typical Nokia solutions in terms of its screen. 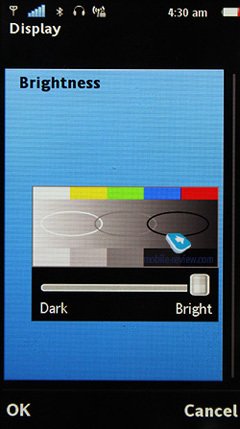 It has a 3.2 " screen with 640x360 (39x69 mm) resolution, aspect ratio - 16:9 and can boast up to 16 million colors. The picture is bright and juicy and attracts attention. 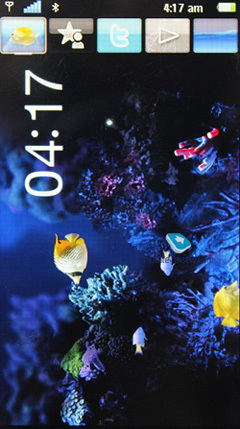 The screen cannot compete with state-of-the-art AMOLED display, but it is quite good for its price range. 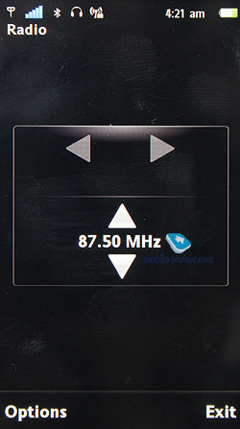 We have resistive screen here, so multitouch is not supported as it is always the case in similar products. The screen is covered with plastic, which is quite thick and hard. There is no difference from glass. I would like to stress, that if you scratch it on purpose the marks will be left, but during the usual everyday use you will not notice any problems. 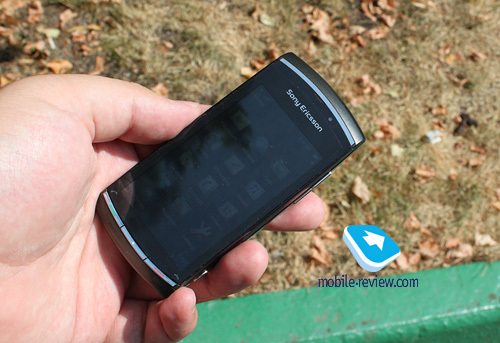 This is not what you get in Nokia 5800 and its clones, but it trails X6 with another plastic type ("glass protection"). 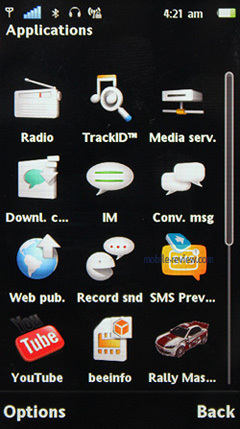 The screen fits up to 14 text lines and 3 service lines. 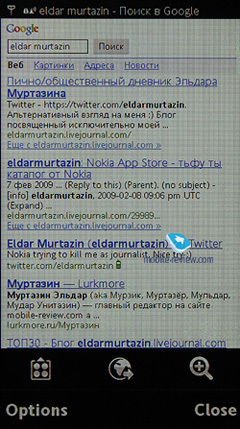 The information is well legible, while the fonts are not similar to those used by Nokia, so you get a different impression from the model. Some will like it, some will not, but this is only the issue of habit. In the box you will find a stylus, which is not necessary as the majority of operations can be carried out with fingers. 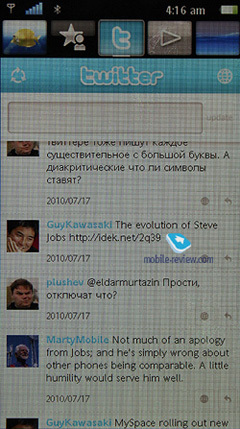 The screen orientation changes with a small delay and it is not as swift as in Android models or iPhone. 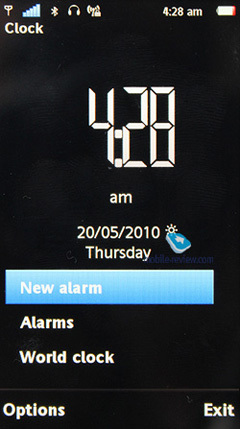 The reason is in Symbian capabilities. 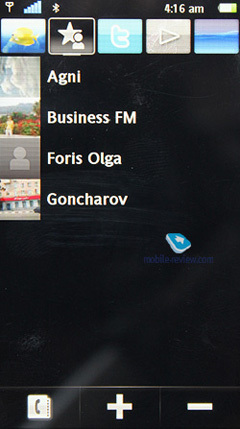 There are three hardware buttons on the front – call, end call and menu buttons. 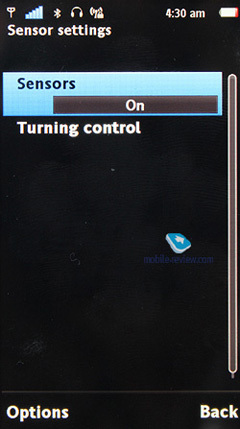 In all menus end call button moves you one level up. 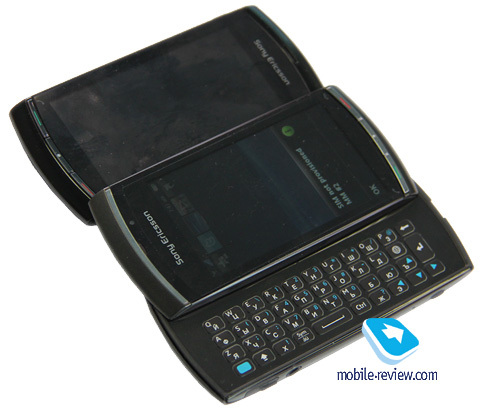 The text can be entered in three different ways or to be more precise by using three keypads plus a traditional QWERTY keypad. I will start from QWERTY keypad. It has 42 buttons in 4 rows. 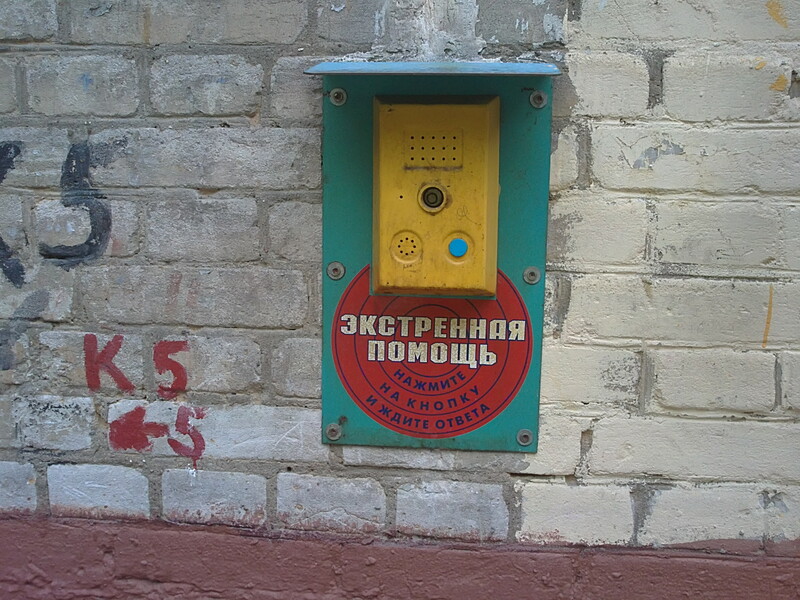 Bigger number of buttons allowed for better localization in Russian. Navigation keys are relatively uncomfortable, but this is the only complaint. The keypad is very good for such a small device. Those who have big hands will not be comfortable as they are likely to touch the phone's edges and it is not easy to move fingers. But this is just the issue of habit and nothing more. 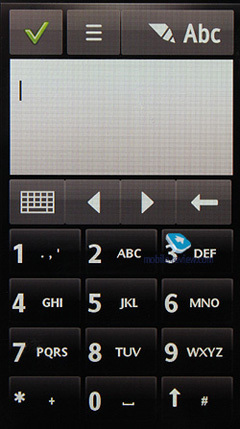 You have to try the keypad before purchase, but girls usually forget about such important trifles. 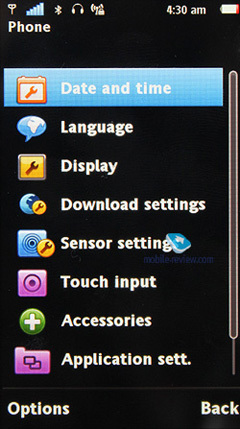 First, we have a traditional keypad with consequential button pressing, which imitates ordinary phones on the touchscreen. It works only vertically and is easy to use with one hand. 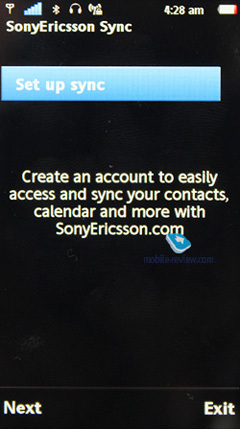 All language packages available for S60 are supported. 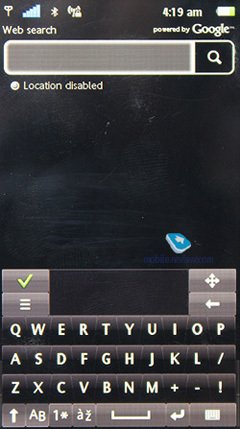 The second type of the keypad is called miniQWERTY and it works both horizontally and vertically. Stylus allows more convenient input with this keypad, but you can use your nails as well. By the way, women will be able to work with the keypad easily and even the long nails are not a problem here. When you choose a letter it is highlighted and becomes larger in size. 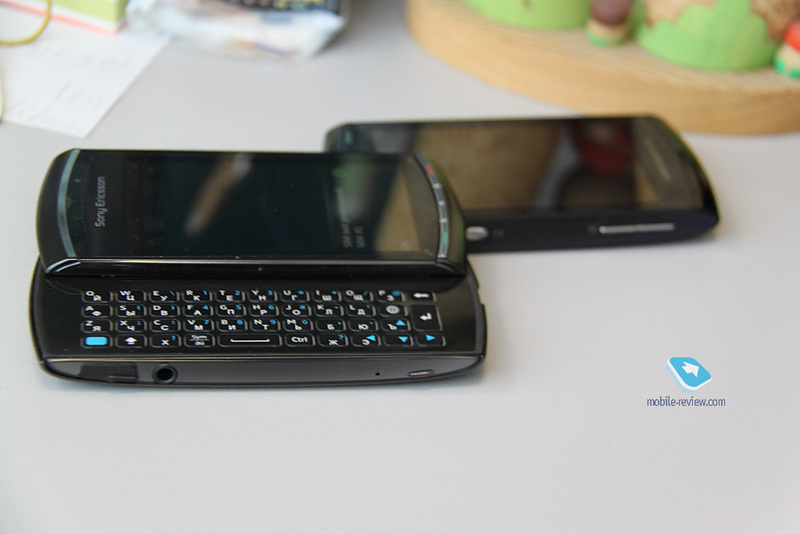 The third type is represented by a usual QWERTY keypad. 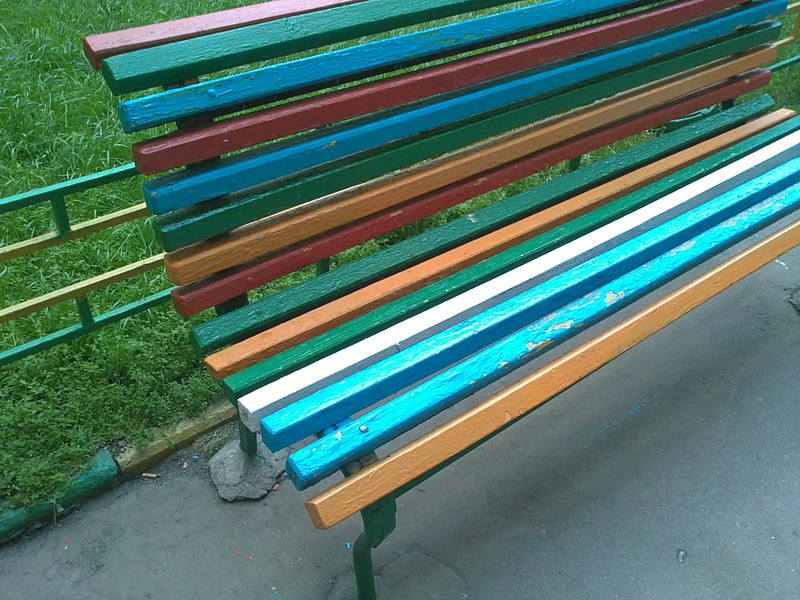 It works only horizontally. The buttons are convenient and can be used with two hands. I can't say anything particular about input types. 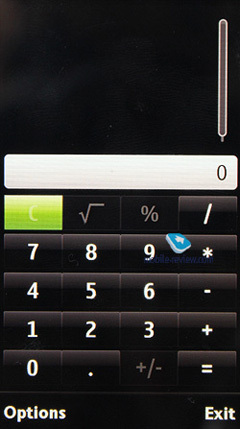 The device offers the maximum available number of them. You can choose to use hands or a stylus. 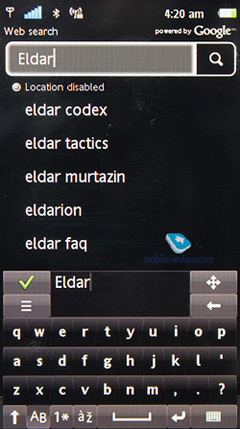 During the predictive text input the word is underlined and by clicking on it you can select its analogue. 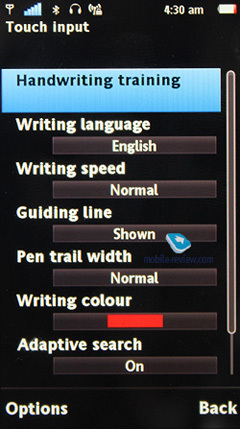 Handwriting recognition is a mere trifle, but if to employ a stylus then it can work well. 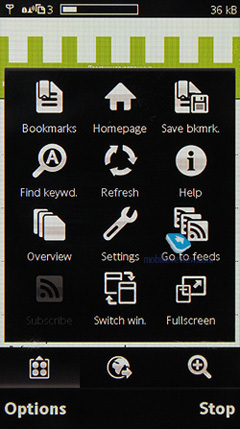 I am not sure many will use the feature, though it is extremely popular in Asia. 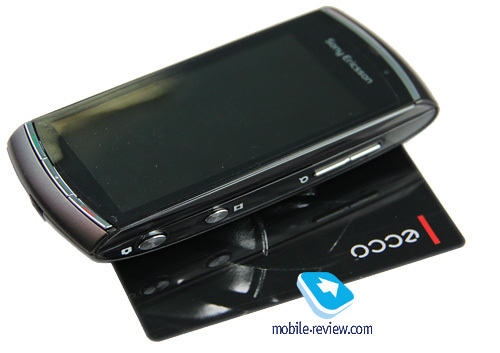 The model features 1200 mAh lithium-polymer battery EP500. The manufacturer claims up to 5.5 hours of talk time and up to 440 hours on standby. The average operation time is around 2 days in real life networks. This time includes 1.5 hours of talk time, a couple of dozens of camera shots, two minutes of video recording and up to one hour of radio or music playback. It takes about 1 hour 30 minutes for a full recharge. 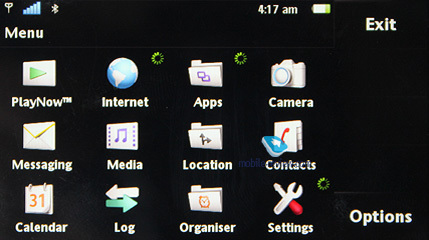 The phone has around 256 MB of RAM (Nokia usually offers 128 MB) and after the start of operation 120 MB are available to users. 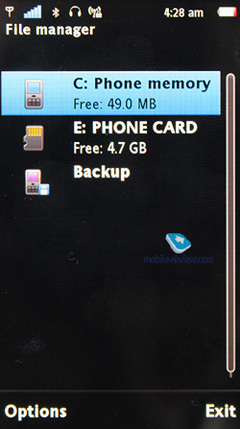 75 MB in the phone itself can be used to store data. In the box you will find an 8 GB memory card, which is enough for the majority of users. We tested the phone with a 32 GB card and it was detected by the phone with ease. 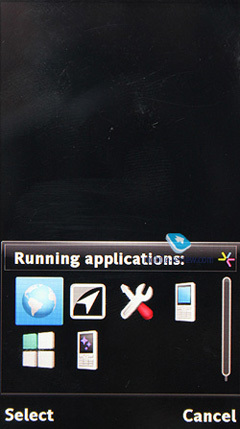 Hot swap is also supported, but you have to open the back cover. 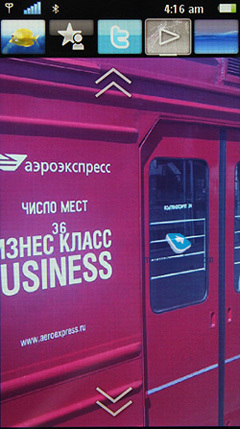 The company cut its expenses on the memory card and it is of class 8. In many menus you can see some sluggishness if you use the card from the box. When you change the card the speed goes up dramatically, so I strongly recommend doing this trick. 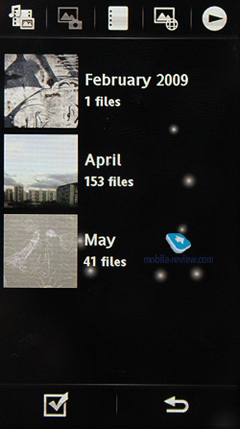 Image Transfer – transfer of photos. 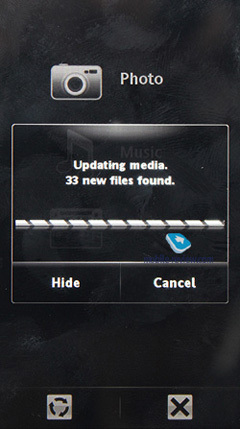 Media Transfer – transfer of multimedia files (MTP). Data transfer speed reaches 5 Mb/s. 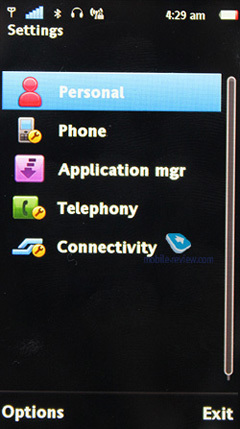 During the connection of the USB cable the phone starts charging in all modes but Mass Storage. Wi-Fi. 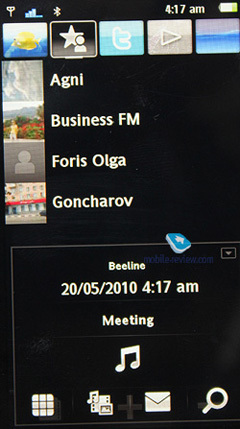 The phone supports Wi-Fi (IEEE 802.11 b/g). 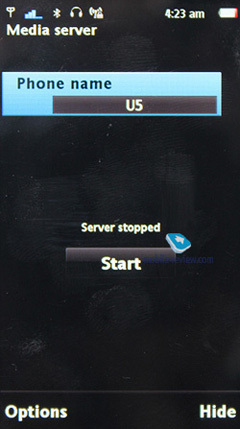 All safety standards (WEP, WPA, WPA2) are available and the settings are maximum. 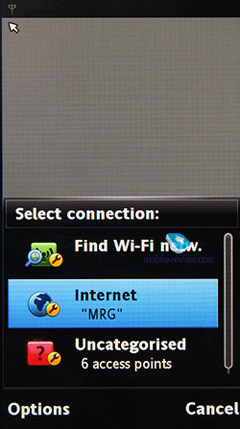 There is Wi-Fi networks wizard and it can search for such networks in the background mode and connect to them if necessary. 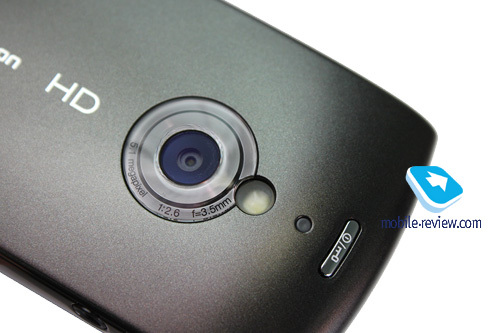 The phone has an 5.1 MP CMOS matrix with the autofocus (Vivaz had 8 MP). It is an inexpensive module, but offers decent quality of pictures. It does not reach the top level, the quality is medium, so there is nothing outstanding here. 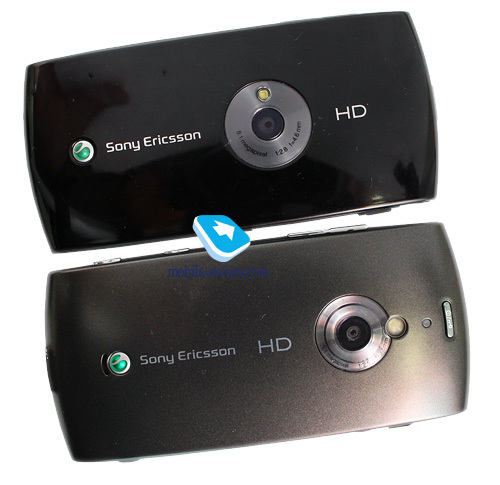 The manufacturer emphasizes that the device records video in HD quality (720p), but this feature is already available in many models. This solution is typical of its class. 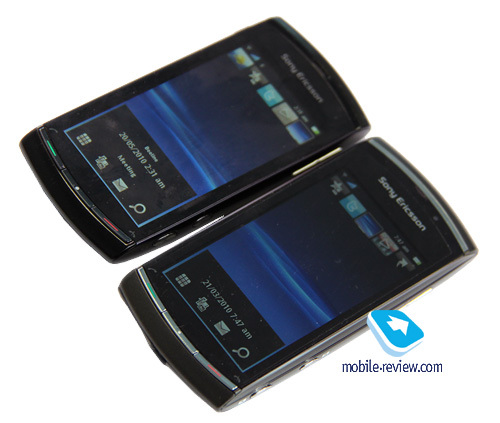 Many customers bought the magic words "HD" and "8 MP", but did not compare it with other models. The camera lens is protected by plastic, gets soiled quickly, but it does not affect the picture quality. The LED flash cannot be used as a torch. 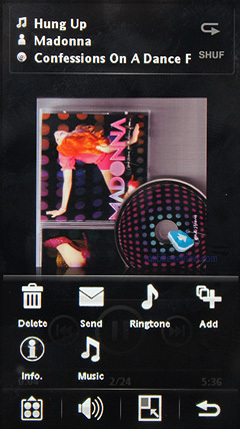 The phone has dedicated keys for camera and video. 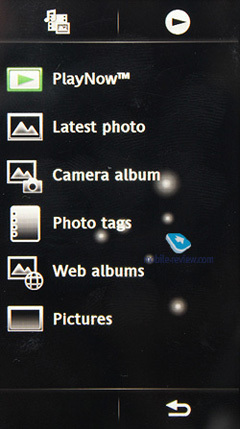 In the camera mode you can choose Scenes – portrait, landscape, twilight landscape, sport, document, snow/beach, twilight portrait. 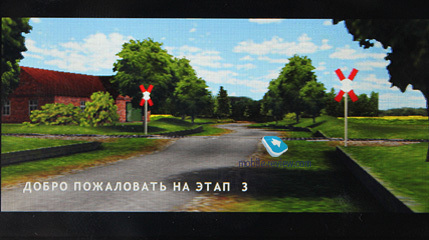 In the shooting modes you can choose focus on smile or screen (select the area by touching the screen) and panoramic shot. Focus centers on the face – macro or infinite. Exposure adjustment from -2 to +2 is also available. 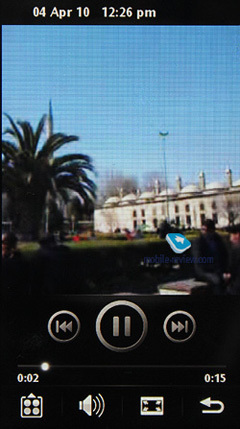 Picture resolutions supported are 5 MP (4:3), 4 MP (3:2), 6 MP (16:9), 2 MP (16:9), 2 MP (4:3). The following effects can be applied – Negative, Solarise, Sepia, Black&White. Look at the photo samples to make conclusions as to the camera quality. Video recording. The company decided to make this feature central for the model. 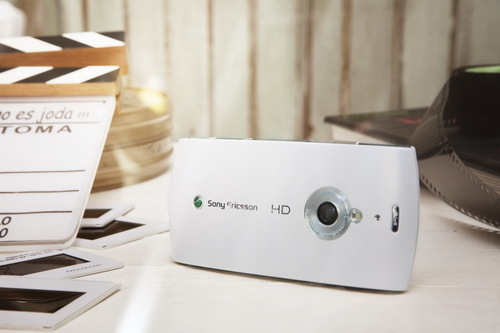 HD recording is available with the resolution of 1280x720 at 24 frames per second. The recording quality is decent, but there is not much of a difference in comparison with other models on the market. 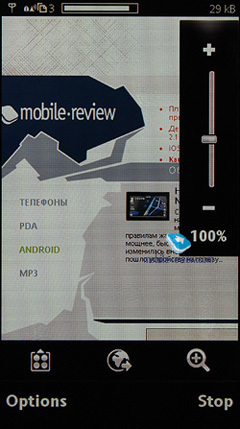 Unfortunately, the cheap matrix does not allow getting the quality similar to comparable Samsung models. This is a complete copy of Vivaz and you don't have to read the section if you remember everything about that model. 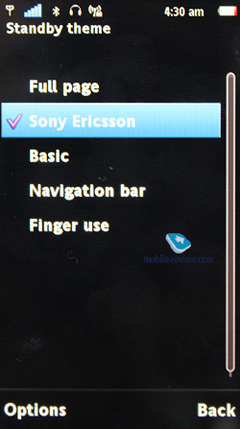 Nevertheless I would like to mention the changes, which Sony Ericsson implemented in the standard platform and how they tried to alter it. It is not a secret that standard icons in S60 5th Edition are boring and not attractive. 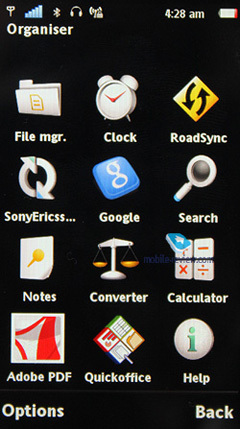 Sony Ericsson changed all standard dialogue windows and icons by offering their own variant. 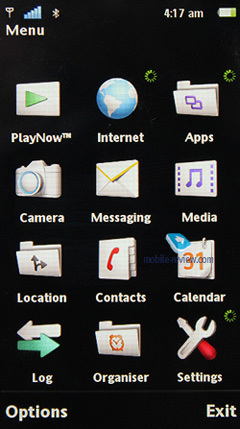 The screen savers and icons are bright and appeal to the young. 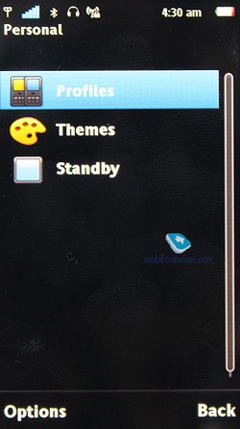 In the standby mode you can select standard themes or chose Sony Ericsson variants. 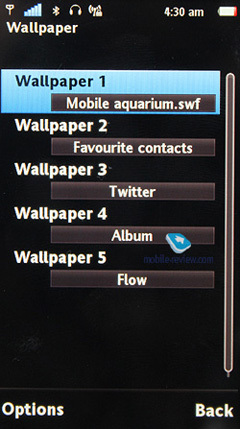 In the latter case you will have 5 screens and on each you can place something else – select the wallpapers or access to media files (photo and video), Twitter, Flash animation and apps, the shortcuts list or contacts for quick dialing. 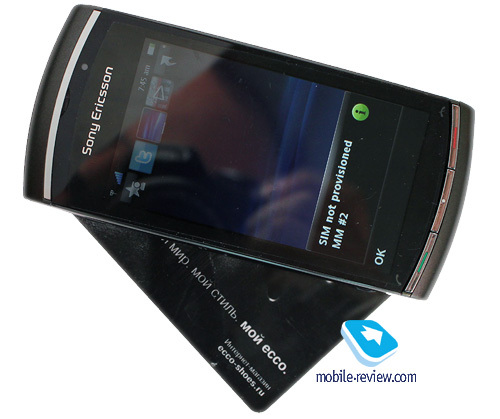 Sony Ericsson tried to improve Symbian as much as possible and stay afloat until the next versions of this OS appear. 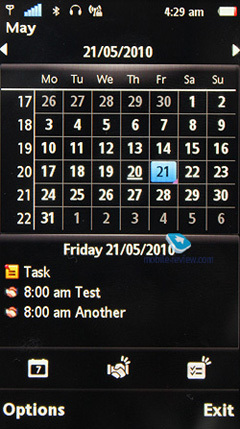 Unlike Nokia, the interface is more convenient to use. 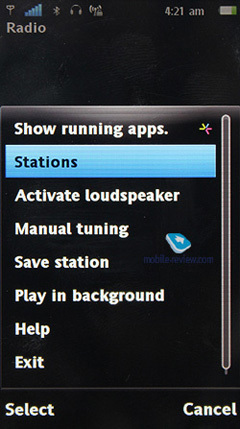 There is a window with applications shortcuts and the player launch (its controls are displayed here as well), date, time and the selected profile. The workspace is arranged conveniently and instinctively easy to use. 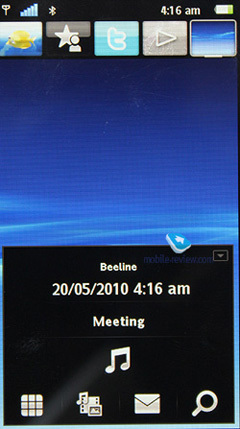 Unfortunately, nowhere in the menu (apart from the quick dialing list) we can use touch panning (it is routinely supported in Nokia products). It is a negative feature of the interface. Media menu was borrowed from A200. 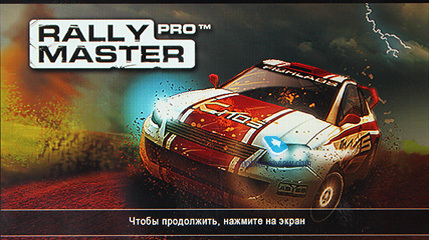 You have PSP style from Sony. 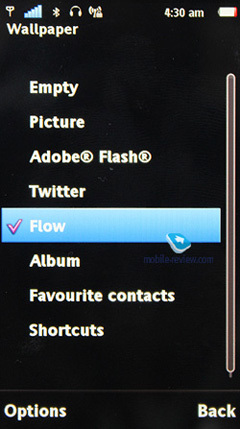 You see different sections, can select photos, video and music. 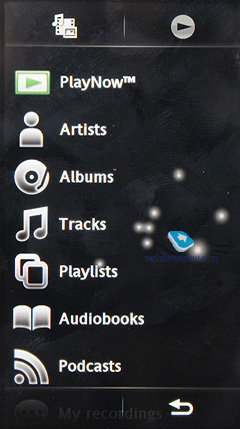 This application easily beats the standard gallery from Symbian. On the downside we have the slow presentation of pictures, but it is caused by the slow speed of reading from the memory card. 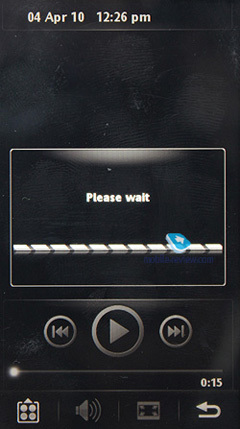 In the player the equalizers are absent and the company somehow believes that the users should download the appropriate free application from PlayNow. Such an equalizer will work in all applications dealing with sound. It should naturally be opened in the memory. There are no complaints about the FM radio. The interface is minimalistic. Navigation works well. 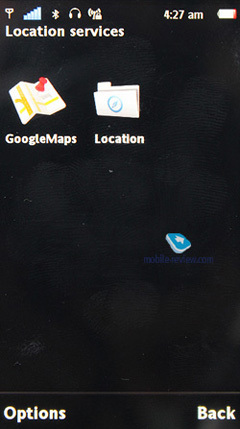 Google Maps and the trial version of WisePilot are available. I think, the owners of the model will not pay for the full version of this software, but some people may need it. 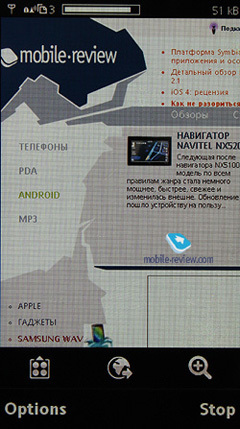 It clearly looses to standard OVI MAPS as Google Maps cannot substitute Nokia product if you need full-time navigation, but if you require this feature occasionally then you will not see the difference. 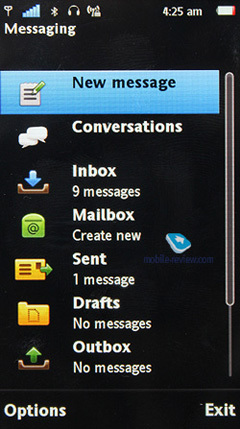 In SMS you can display all communication as the chat. It takes some time to start, especially if you have many saved messages. 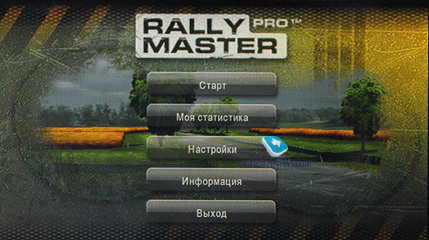 The handset has only one game – "Rally", but it is quite interesting. I will not describe the apps for YouTube and Facebook, because they are quite traditional. 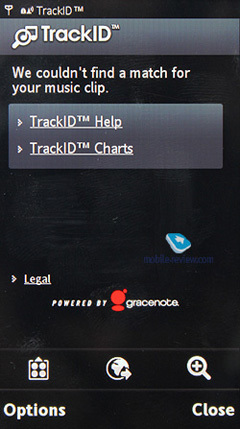 The same applies to TrackID (music recognition). 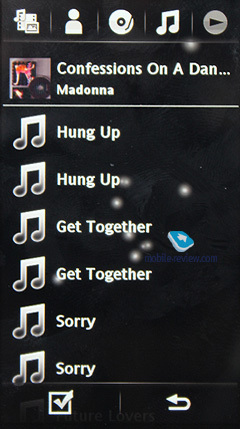 The ringtone volume is medium and you can miss a call if the phone is in your pocket, especially in winter. The same can be said about the vibro, which is not powerful enough to be noticed at all times. These drawbacks are predetermined by the model's size. There was no space for a more powerful loudspeaker and better vibro. Unlike Vivaz, this model has a different location of the microphone and the interlocutor hears you worse, especially if you speak from the noisy street. 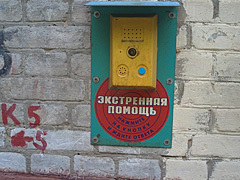 The dictaphone does not work during the call and the phone cannot be used without the SIM card. 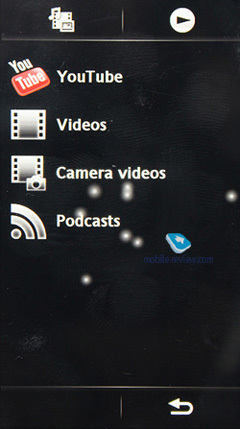 Cost cutting on the memory card considerably spoils the impressions from the phone. 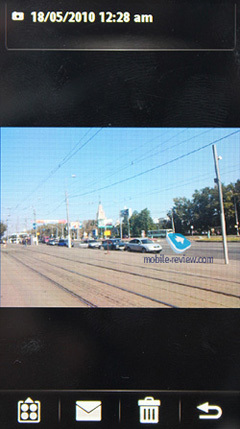 If you want to view pictures and watch video properly and have no problems with the speed of operation you should get rid of the card from the box. As the version of Vivaz this phone happens to be odd. 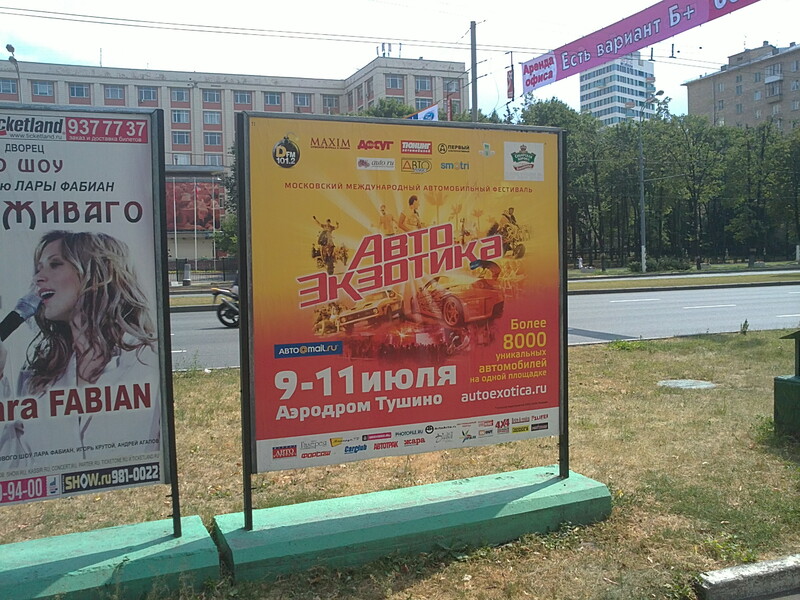 Who will buy it? It has too many deficiencies for business users while glamorous ladies do not need a keypad. 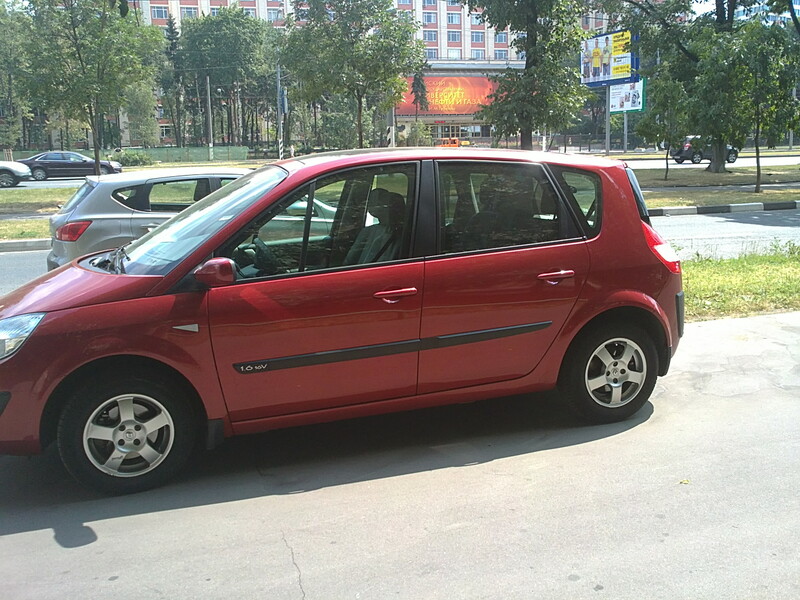 The segment of those who may get interested in Vivaz Pro is tiny, which is the main problem of the model. It was created not for a group of customers, but just to expand the product range. 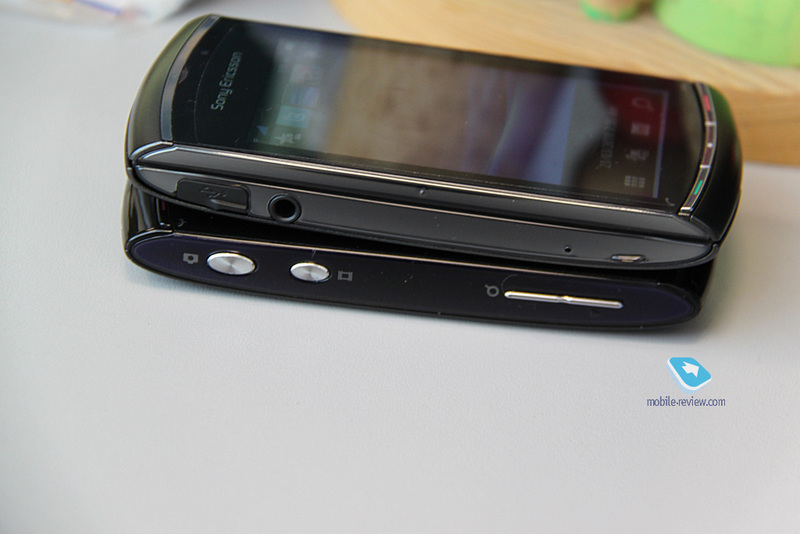 In July the market will see the release of Nokia C6 priced at €300 and Vivaz Pro for €400 will get lost. 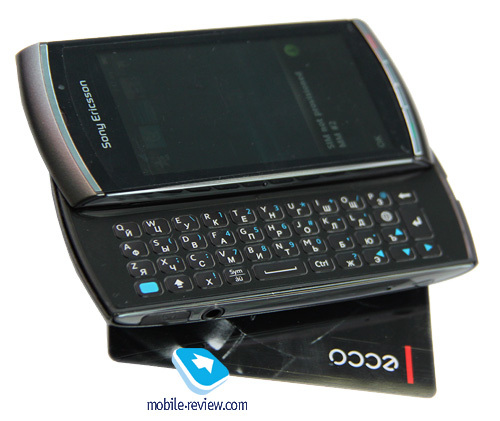 This SE device has a similar price with Nokia N97 Mini, which is an absolute madness. You have to be overconfident to position the phone on par with the flagship from the leading manufacturer. The verdict is straightforward – the phone will attract dust from the shelves not the customers. There are no other options.